The Mexican war of independence from Spain lasted from 1810 to 1821. In 1822 Agustin de Iturbide y Aramburú proclaimed himself emperor of Mexico. His reign lasted less than a year. Soon thereafter the new Mexican Republic organized an army, and helmets, strongly influenced by the Napoleonic style, were introduced. They remained in service until the late 1840s. 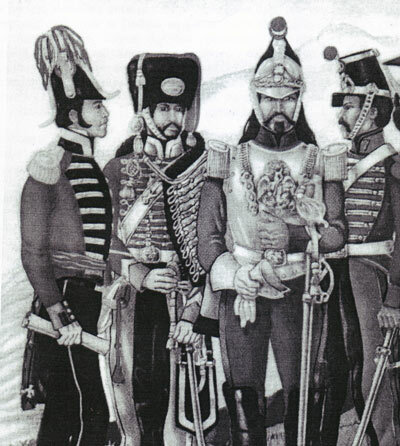 During the Mexican-American War of 1846-1848, the regiment of cuirassiers from Tulancingo (Coraceros de Tulancingo) wore French style uniforms and helmets. 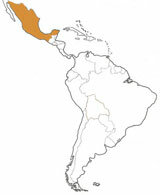 In the 1860s, Mexico became an empire once again with the installation of Maximilian of Austria as emperor. As a result the Palace Guard wore an Austrian-inspired uniform with a prestigious metal helmet bearing a Mexican eagle on top. After 1867 and the restoration of the Republic, various types of Pickelhaube (some in metal) were issued and remained in use until the First World War. On the eve on the First World War, an artillery helmet, known as the Zaracof, was in wide use. In the following years, the Stahlhelm was phased out and the Casco de Corcho (pith helmet) become the standard helmet of the Mexican officers. In 1938, after years of hesitation and experimentation, the French M26 Adrian, decorated with a variety of frontal badges, was finally issued to the Mexican armed forces. The liners were manufactured locally. With the war in Europe and the occupation of France by Germany interrupting shipments from France, a Mexican version of the M26 was manufactured locally in 1940, principally by the firm Troqueles. A crestless version was also produced on a small scale. In 1945 some US M1917-A1 were imported, but later that same year, the more modern US M1 was distributed and enthusiastically adopted. Badges were often worn on the liners. The Adrian and the M1 were to coexist until 1952. In 1985 a ballistic M1 model fabricated in Korea was introduced as well as a non-ballistic plastic M1 produced locally. The light helmet was worn with the national tricolor cockade on the front and often with side emblems. In 1984 some prestigious units, including the Presidential Guard, began receiving US PAGST models. These are quickly replaced by clones produced locally and more economically. The Navy, Air Force, and Police use the same helmets as the Army but painted with their respective colors. Armored vehicle crews have generally used American helmets, except for some German Bundeswehr models in the 1980s.